With a growing baby bump in tow to keep warm, Kate Middleton attended multiple events this weekend and broke out not one, but two new coats for the occasions. The first was a double breasted coat from Matthew Williamson, worn to engagements in Wales on Saturday. The powder blue popped prettily against her shirtdress (from Hobbs) and the poppy brooch, which is traditionally worn in remembrance this time of year. If you&apos;re so inclined (and have an extra $2,650 sitting around) there are still a few of the coats left on Net-a-Porter in UK sizes 6 and 12. The second was this black number by standby Alexander McQueen. 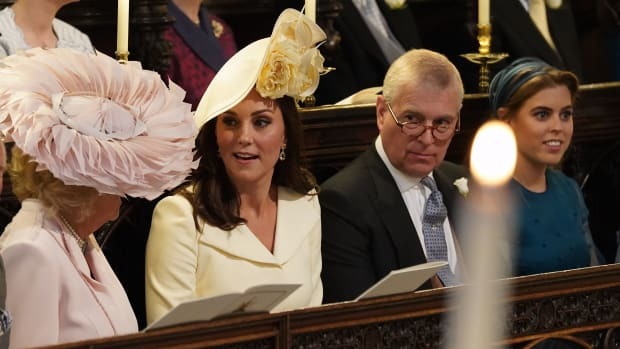 It was an appropriate choice, as the Duchess was attending Remembrance Sunday events, which commemorate the lives of British soldiers sacrificed in World War I and World War II. What Kate Wore notes that the coat is still available in black at a few select retailers, as well as in cream if you&apos;re not prone to spilling coffee everywhere in the mornings like some people (definitely not me). Middleton wore her first repeat outfit of the trip Monday, but she had a good reason for it. If you're looking to squash pregnancy rumors, a tailored waist like this is a pretty good route. This is how you fight the rainy day blues.